Will the Oakland Raiders relocate to Manchester next season? Sources say team officials have been secretly meeting with Councilors to work out a deal. “We always have room for one more football team.” said a source close to Lord Mayor Paul Murphy. Since the NFL rejected their bid to build a stadium and move to Los Angeles, the Raiders have been looking for a new home, as well as trying to get more money to build a new stadium in Oakland. 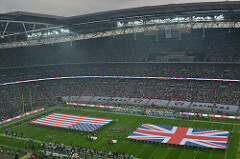 Though the mainstream American media have focused on other American cities as the Raiders’ new home, Councilors say Manchester is a top candidate. The sources agree that the Raiders would play their 2016 games at Etihad Stadium. A sticking point in the negotiations, however, is the plan for the new stadium. The Raiders want a ($2 Billion) stadium funded entirely by the tax payers, promises to upgrade the stadium every time a new NFL stadium is built, a promise to never tax the team, and an open lease that allows the Raiders to leave relocate any time they want to. The councilors, however, proposed building a modest stadium, in exchange for majority ownership of the team, a promise that the team will pay their local taxes, and the signing of a 2000 year lease. Anonymous city employees say surveys prove there is local interest in bringing an NFL team into Greater Manchester. The NFL and the Raiders could not be reached for comment.